Though he is not known nearly well enough in the U.S., Matthew Good made me want to be a writer. The Canadian musician is a prolific artist, with his work also including blogging and political activism. His work, both with The Matthew Good Band and solo, has always come from a brutally honest place, often served up with a side of sharp political critique. What sets Arrows of Desire apart from Good’s previous solo output is its simplicity. While experimenting musically and vocally has produced brilliant results–the stuttering, teetering track “Avalanche” ought to be heard in full by everyone–this record draws power from the fact that it goes back to basics. It sounds like it could have been recorded in the ’90s, when The Matthew Good Band were coming into their own amongst the alternative, guitar-driven acts of yore. For me, the greatest song is “Mutineering,” which is tender without going too far into ballad territory. You can picture a man with great debts begging with his lover to cut ties before it’s too late. The lyrics are just enough to be atmospheric without giving the plot away too much. Also worth checking out are the menacing but gorgeous “Garden of Knives” and “Letters in Wartime,” with its build and fade making it a perfect closing track. 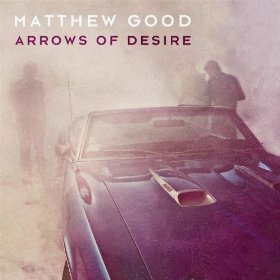 With Arrows of Desire, Good shows that he doesn’t need a lot of style to make a great album. It’s just what lifers were born to do.